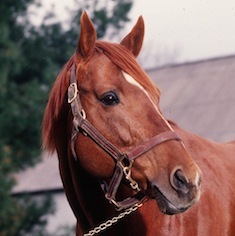 On the 25th anniversary of Secretariat’s passing, Secretariat.com President Leonard Lusky ponders the reasoning for the magic of Big Red in an appreciative tribute to the 1973 Triple Crown champion. What is it about Secretariat that holds the attention of the American public more than 40 years after his spectacular racing campaign of 1972 and 1973. How do you define the reasoning that manifests itself in a legion of fans, some who were there to witness history in the making, others, a newer generation who shape their affection from YouTube snippets or the dog-eared pages of their parents’ newspaper clippings. What is it about this horse that stirs the memories or captivates the imagination in a democratic fusion, unrestricted to age, race or gender. Perhaps the answer lies in the timing. In the early 70’s, our country was torn and tormented by Vietnam and Watergate and Secretariat provided a divided populace a reason to collectively cheer. It didn’t matter the accolades were bestowed upon a four-legged athlete and it didn’t hurt that the shared adoration took on a patriotic tone. Inspiration took the form of a charismatic, red thoroughbred built like Adonis and adorned in white and blue checks. Maybe it was the purity of that over-sized heart, coursing with courage and competitive fire and the sheer joy of running… and running fast. Or perhaps it was Secretariat’s connections that endeared us to this brief shining moment in racing history. Was the affection related to his elegant and approachable owner Penny Chenery, the voice for Secretariat and an attractive new face within an old-guard industry. Was it his fearless jockey Ron Turcotte, astute trainer Lucien Laurin, devoted groom Eddie Sweat, and talented exercise riders Charlie Davis and Jim Gaffney – each key contributors and anointed royalty in the mighty Meadow Stable court – an equine Camelot of sorts. Perhaps it is the recent headlines garnered through the princely (and princessly) bloodlines of successful descendants, or the glamorous reflection from Disney’s Hollywood spotlight – ample ingredients in a concoction of contemporary relevance. It cannot be denied, the Secretariat impact continues to reverberate and his legacy is indelibly burned into the consciousness of America. He has transcended his sport to become a timeless cultural phenomenon – for many, a veritable chestnut Elvis.